If a crab gets stuck somewhere because of the shell will they abandon the shell for another one? I imagine if they absolutely can't get dislodged for any reason they eventually might, but I think that would be extremely rare. Crabs hold on to their shell as it is protection for their soft abdomen so it would take quite a lot to get them to just abandon their shells. Their legs and claws are actually extremely strong, and they can move a surprising amount of weight for their size, so I have never had one truly get stuck, so I can't say for sure. They seem to move whatever is in their way. I imagine they would just struggle until they were dislodged if they did for some reason get stuck though. Rawrgeous wrote: I imagine if they absolutely can't get dislodged for any reason they eventually might, but I think that would be extremely rare. Crabs hold on to their shell as it is protection for their soft abdomen so it would take quite a lot to get them to just abandon their shells. Their legs and claws are actually extremely strong, and they can move a surprising amount of weight for their size, so I have never had one truly get stuck, so I can't say for sure. They seem to move whatever is in their way. I imagine they would just struggle until they were dislodged if they did for some reason get stuck though. Es are pretty famous for doing just this! I have had them ditch shell and jump from my hands just from trying to hold them up by the shell to get a better look at them. 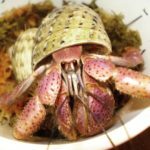 Crabs are not so attached to their shells that they will risk their lives to keep them, but individual crabs have different amounts of patience when it comes to trying to work free when stuck. Most will be willing to put a lot of work into gettinf free and take their time to do it, but some - especially Es - seem like they don't even bother trying. wodesorel wrote: Es are pretty famous for doing just this! I have had them ditch shell and jump from my hands just from trying to hold them up by the shell to get a better look at them.